Today it's back to the attic for another photo from the family album! This is a photo of William Arthur Maas, my great-grandfather. He was born in Quincy, Illinois, the ninth of thirteen children. When he was a young man, he moved with his brother Leo to Kansas City, Missouri, and worked a number of jobs (salesman, real estate, stock broker) before marrying and moving the family to California. This photo is one of a series of little snapshots. It comes at the end of several where he is at the top of the trees picking fruit in his suit. A long time ago, people tended to wear nicer clothes at all times. I like the relaxed look here where even his dog looks content. So, what kind of fruit is in the BUTTER box? It's certainly a nice picture. In what year was it taken? r, I don't know what kind of fruit it is. Maybe small apples? Rob, I would guess sometime between 1925 and 1930. 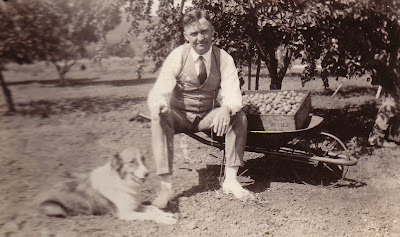 The photo is not dated, but he was still living in the Midwest in 1924 and this looks like California to me. Is his dog an English Shepherd (old Farm Collie)? Looks like it was a beautiful day - thanks for sharing this with us!